[149 Pages Report] The global account-based marketing market size was USD 534.8 million in 2017, and is projected to reach USD 1,196.9 million by 2023, growing at a Compound Annual Growth Rate (CAGR) of 12.9% during the forecast period. The base year for this study is 2017, and the forecast period is 2018–2023. Account-based marketing complements the lead generation strategy, in which businesses turn their attention to high-value accounts and try to reach stakeholders in a personalized manner with the intent to generate more revenue. To define, describe, and forecast the account-based marketing market based on account types, components, deployment models, organization size, industry verticals, and regions. The research methodology used to estimate and forecast the account-based marketing market begins with capturing the data on key vendors’ revenues through secondary research sources, such as companies’ websites, Factiva, and D&B Hoovers. The other secondary sources include annual reports, press releases, and investor presentations of companies; white papers and certified publications; and articles from recognized authors, directories, and databases. The vendor offerings are also taken into consideration to determine the market segmentation. The bottom-up procedure is employed to arrive at the overall market size of the global account-based marketing. 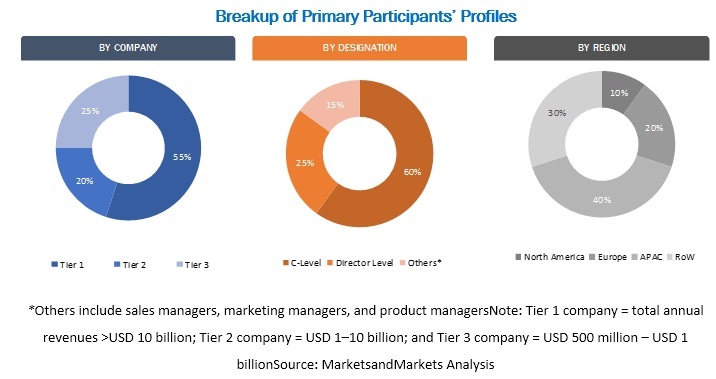 After arriving at the overall market size, the total market is split into several segments and subsegments, which are then verified through primary research by conducting extensive interviews with the key people, such as Chief Executive Officers (CEOs), Vice Presidents (VPs), directors, and executives. The data triangulation and market breakdown procedures are employed to complete the overall market engineering process and arrive at the exact statistics for all the segments and subsegments. The account-based marketing ecosystem comprises major vendors, such as Demandbase(US), InsideView (US), 6Sense (US), Act-On Software (US), AdDaptive Intelligence (US), Albacross (Sweden), Celsius GKK International (France), Drift (US), Engagio (US), Evergage (US), HubSpot (US), Integrate (US), Iterable (US), Jabmo (France), Kwanzoo (US), Lattice Engines (US), Madison Logic (US), Marketo (US), MRP (US), Radius Intelligence (US), TechTarget (US), Terminus (US), Triblio (US), Uberflip (Canada), and Vendemore (Sweden). Other stakeholders in the account-based marketing market include consulting service providers, Information Technology (IT) service providers, managed service providers, resellers, enterprise users, and technology providers. The study answers several questions for the stakeholders, primarily, which market segments to focus in the next 2–5 years for prioritizing the efforts and investments. The global account-based marketing market size is expected to grow from USD 651.9 million in 2018 to USD 1,196.9 million by 2023, at a Compound Annual Growth Rate (CAGR) of 12.9% during the forecast period. Major growth drivers for the market include the focus on identifying the right audience, growth of social media and social advertising, and increased customer lifetime value. In the account-based marketing market by account type, the strategic account-based marketing segment is expected to grow at the highest CAGR during the forecast period. The major growth driver is the increasing need by organizations to focus largely on larger accounts and target individuals directly in the company. The telecom and IT industry vertical’s market size in the account-based marketing market has grown rapidly, due to the increasing number of subscribers generating large volumes of data and adopting account-based marketing for providing customers with better IT-enabled solutions and services. The government and public sector vertical, however, is expected to grow at the highest CAGR during the forecast period. Government and civil service agencies adopt account-based marketing tools and services to understand customer behavior from the managed big data. Government and public sector organizations focus on customer-centric strategies to enhance customer satisfaction. They adopt account-based marketing services to leverage new data capabilities for clients in the public sector which shows increased interest in targeting specific job functions. The account-based marketing market by deployment mode includes on-premises and cloud deployment modes. The cloud-based deployment mode benefits organizations with increased scalability, speed, 24/7 services, and improved IT security. Owing to an increasing number of applications being deployed over the cloud, there is a shift from traditional on-premises account-based marketing solutions to cloud-based account-based marketing solutions across enterprises of all sizes. 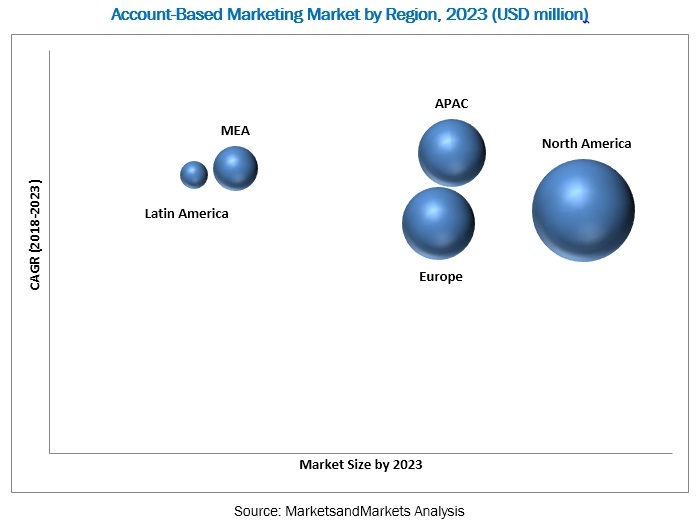 The global account-based marketing market by region covers North America, Europe, Asia Pacific (APAC), Latin America, and Middle East and Africa (MEA). North America is expected to hold the largest market size in the market by regions, as account-based marketing solutions have already penetrated in the region. APAC is expected to grow at the highest CAGR, owing to the presence of half of the world’s mobile users, the largest number of social media users, the rising trend of online shopping experience, and the increasing internet connection and speed in the region. Account-based marketing market faces challenges, such as selection of the right tools for account-based marketing, and GDPR and data collection practices. Lack of awareness and reluctance to shift from traditional sales practices, and inaccuracies in the data sets may limit the market growth. Major vendors offering account-based marketing solutions across the globe include Demandbase (US), InsideView (US), 6Sense (US), Act-On Software (US), AdDaptive Intelligence (US), Albacross (Sweden), Celsius GKK International (France), Drift (US), Engagio (US), Evergage (US), HubSpot (US), Integrate (US), Iterable (US), Jabmo (France), Kwanzoo (US), Lattice Engines (US), Madison Logic (US), Marketo (US), MRP (US), Radius Intelligence (US), TechTarget (US), Terminus (US), Triblio (US), Uberflip (Canada), and Vendemore (Sweden). They have adopted many types of organic and inorganic growth strategies, such as new product launches, product upgradations, partnerships, collaborations, agreements, and acquisitions, to further expand their offerings in the account-based marketing market. *Details on Business Overview, Software, Solutions & Platform, Key Insights, Recent Developments, SWOT Analysis, MnM View Might Not Be Captured in Case of Unlisted Companies.